On March 19, 2019, Kazakhstan’s President Nursultan Nazarbayev made an unexpected address to the nation, announcing his resignation. The 30-year era of one of the most respected and authoritative politicians in the post-Soviet space is over. Therefore, now is the right moment to evaluate the legacy of the first president of Kazakhstan, both in the context of bilateral Russian-Kazakh relations, and in terms of Eurasian international politics as a whole. Perhaps it would not be an exaggeration to say that Nursultan Nazarbayev can be called a founding father of modern Eurasian integration. It was his programme “Ten Simple Steps Towards Ordinary People”, launched in 1998, that allowed for the CIS to be transformed from a confused “divorce” process between the post-Soviet states into a structure with a realistic, positive agenda. Moreover, it allowed the states of the region to formulate the values ​​of the new platform for Eurasian integration. This, in turn, allowed for the development of new institutions, ultimately facilitating the creation of today's Eurasian Economic Union (EAEU). It is useful to recall, in connection with this, that Nursultan Nazarbayev became leader of Kazakhstan during the Soviet period. Moreover, many have recalled that in the summer of 1991, his candidacy was seriously considered for the post of prime minister of the Soviet Union. However, the Moscow putsch of August 1991 prevented this, and the unstoppable disintegration of the Soviet Union followed. It’s tempting to speculate what the Soviet Union might have been like with Nursultan Nazarbayev at the helm, if there hadn’t been a putsch, and if it could have survived. In his retirement speech, he clearly spoke about the modernisation of Kazakhstan, contrasting it with the “Soviet empire”. But it seems that it was his Soviet experience on a USSR-wide scale that led to the emergence of those new Eurasian initiatives which he later introduced. If we evaluate Russian-Kazakh relations during the presidency of Nazarbayev, they have always been distinguished by their constructiveness and sense of partnership. Recalling the history of these thirty years, it’s hard to find difficult or conflicting moments that threatened to permanently sour bilateral contact and weren’t resolved in a way that benefited everyone. Therefore, it is not a big exaggeration to say that with all the constraints of real politics, it is properly our partnership with Nazarbayev’s Kazakhstan that can be considered the optimal model for Russia’s bilateral relations in the post-Soviet space. As far as all other CIS countries are considered, Russia's bilateral relations have experienced many more fluctuations over the years. Naturally, this is largely due to hydrocarbon reserves, which have made Kazakhstan an economically self-sufficient state. Therefore our relations have far outgrown the level of simple sponsorship from Russia (and the search for this sponsorship from its partners) in contrast to a number of other examples. While resources played a role, the role of a leader eager to establish a dialogue with Russia, namely President Nazarbayev, also must not be understated. The first Kazakh president played a key role in the implementation of the large-scale confluence strategy between the EAEU and the Chinese Belt and Road initiative, which has been implemented since 2015. Without the support of Kazakhstan, it would have been much more difficult for Russia and China alone to have carried out this confluence project. Thus, Kazakhstan has acquired paramount importance for Russia, not only as a key partner in the post-Soviet space, but also within the framework of the continent-wide projects of Greater Eurasia. Of course, in realpolitik there are no situations where everybody absolutely agrees with each other. 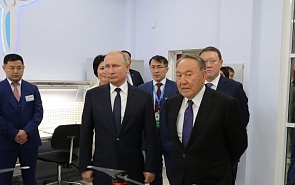 Despite the optimal model of Russian-Kazakhstan relations, one should naturally not think that absolutely every action taken by Nursultan Nazarbayev was beyond the reproach of Russian public opinion. Examples of contention can be found. What lies on the surface, is, for instance, that Kazakhstan didn’t always vote jointly with Russia on the UN General Assembly resolutions that were significant for us in connection with the Ukrainian crisis, unlike Russia’s other CSTO and EAEU partners. One decision which caused a lot of controversy in Russia was the decision of the Kazakh president to switch the Kazakh language from the Cyrillic to the Latin alphabet. In the context of the tremendous attention that is now paid to the policy of preserving historical monuments in Russia, this step did not pass unnoticed. On the other hand, since stability and strategic steadiness underscore our bilateral relations and serve as their basic principles, these actions did not lead to a wave of official mutual accusations in public (unlike what happened with a number of other post-Soviet countries). This approach was also manifested in the media. Again, in contrast to a number of other EAEU/CSTO countries, Kazakhstan extremely rarely became the object of criticism in sharp political talk shows on leading Russian TV channels. Even the Latin alphabet was covered in these talk shows almost tangentially. This, among other things, clearly proves that in its information and media policy, Russia emphasizes its focus on a constructive partnership with Kazakhstan. In addition, we need to understand the logic of Kazakhstan’s decision-making in these matters, to look at the situation through the eyes of the other side. We should not conceal, that the actions of Russia at the initial stage of the Ukrainian crisis in 2014 caused some concerns in the capitals of other post-Soviet states. They began to figure out ways in which the notorious calls that “we can do it again” could be applicable to their own territories. In the case of Kazakhstan, which remains home to a large Russian diaspora community, this concern should not be underestimated. Moreover, Russian ultranationalists, while relatively few in number, in the context of the events of 2014 periodically began to throw around ideas about the “Crimean scenario” in relation to “Southern Siberia” or “Novosibrossiya”. This was reflected in their comments once again following the resignation of Nazarbayev. Naturally, this whole set of historical myths could not but cause caution regarding the future of Kazakhstan’s politics. The same motives also drove the internal political struggle in Kazakhstan in relation to the eventual opponents of the first Kazakhstani president (for example, allusions about the so-called “Chimkent People’s Republic” in the Tokhtar Tuleshov case). But on the whole, it is important to emphasize, that these “near-Crimean” phantoms failed to undermine the constructive and mutual trust in relations between our two states. Here they stood the test of time. Now our key task should be the preservation and development of the positive dynamics that were established in Russian-Kazakh relations under Nursultan Nazarbayev. The fact that he continues to serve as the Chairman of the Security Council of Kazakhstan and the leader of the ruling party provide serious reasons for maintaining that continuity. New Acting Kazakh President Kassym-Jomart Tokayev has already announced his intention to develop cooperation with our country. Russia should fully support Kazakhstan during this period of power transition. We need to understand that without a partnership between Russia and Kazakhstan, no effective integration policy in Eurasia would be possible.